HVP believe good community relations create a positive work environment and reduces the risk to our business. HVP Plantations staff work and live in the many communities we operate in. We are involved in varied community partnerships to improve the environmental and social values in these areas. Projects such as the maintenance of public picnic spaces, the preservation of cultural sites such as Bishops Green, involvement in education delivery with universities and local school tours, support of local events, sporting and community groups, management of school plantations and involvement in the Gippsland Arson Prevention Program, all encourage local involvement in and understanding of HVP operations and the broader forest industry. HVP Plantations manages a number of small plantations in the north east of Victoria on behalf of some local schools in the region. 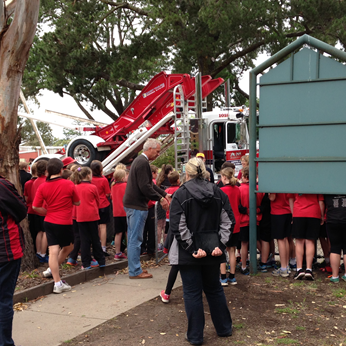 HVP's Log Truck Safety Program operates in Schools that are located close to haulage routes and aims to improve the safety knowledge of kids when it comes to interacting with these powerful machines. Prior to this years fire season, HVP Shelley staff hosted over 20 people from DELWPand CFA, both regional staff and local brigades for the annual Shelley Fire Day.